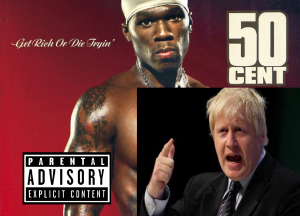 Boris Johnson caught reciting 50 Cent’s “In Da Club” in Stornoway Free Church. Having caused controversy earlier in the week by reciting a colonial era poem by revered poet and dead racist Rudyard Kipling in a sacred site in Myanmar, Boris has come under fire during a state visit to the Western Isles. Boris was seen to be enthusiastically reciting the folowing lyrics to 50 Cent’s “In Da Club” during a particularly guilt inducing sermon at Stornoway’s United Partitioned Twice-removed Free Church. The church takes a hard-line position against accompanied music in church and did not include 50 Cent on it’s list of top 50 rappers who won’t burn in hell. Boris was in the Isles’ capital to discuss the impact of Brexit on the island’s 3 main exports – Black Pudding, Hebridean Lamb and shame. “This will be ruddy splendid for Lewis” squealed Boris before boarding the Sunday Ferry blowing an airhorn and frantically waving his sparkler.